Home to terrible beasts, mischievous fey, rugged individualists, and slumbering evils, the vast boreal forests of the north have inspired awe and instilled an instinctual vigilance. Among attempts to cartograph and control the region, one hopeful band of missionaries sought to expand the reach of their faith while simultaneously planting the flag of order at the epicenter of chaos. They constructed a grand mission over the next half-century, a fortress of marble and gold leaf standing as a monument to the stubbornness of mankind and the blessings of the divine. They welcomed all in the name of peace and prosperity, but hid the terrible secret behind their success: the backing of regional barons. The fortress-like nature of the mission was no coincidence, but proof of the unsightly truth. In time, the people of the forest balked at outsider authority, refusing the hospitality offered to them. This burgeoning conflict caught the eye of the incubus Rakaz'greh, who was forged from a corrupt member of the very faith intruding upon the forest. Exceedingly clever even for his kind, the incubus sowed the seeds of war. Soon open conflict had erupted, consuming portions of the forest in flames and seeing parts of the mission destroyed or otherwise abandoned. As the death toll grew and the mission's security waned, Rakaz'greh played every side of the conflict. He drew desperate supplicants and supporters and, when the time was right, swept the battleground clean of his weakened opposition. With the mission breached, the forest blighted by war, and his opponents routed, Rakaz'greh sits upon the defiled chapel as though it is his throne. With an enclave of loyalists and bound servants, he maintains a tenuous control over most of the ruined fortress. Yet even the demon's victory was not seamless. Uneasy dead haunt the catacombs, loyal to none. Predators twisted by the demonic blights hunt the forests for the sheer joy of slaughter. Surviving missionaries, sheltered away in fortified cellars, look upon all with suspicion of demonic corruption. The surviving fey hold to their blood feud out of spite, fighting with zeal to protect what little remains untainted by Rakaz'greh. Between them, the crumbling ruins, improvised traps, and demonic blight make simply moving through the ruins a challenge. But above all, Rakaz'greh grows increasingly arrogant and will soon set his sights upon the forceful annexation of more land beneath his foul banner. This adventure location has a succinct history and I have a clear understanding of all the players in the area at the time when PCs would come exploring. You’ve got an obvious villain in Rakaz’greh, but you make sure to include other threats, such as undead, fey, and even surviving missionaries who may mistake the characters for agents of evil. The mission itself needs more description, especially since the adventure takes place, but it is obvious the building is the focus for the conflict in the forest. I also would have preferred this stretch of forest to have a name, since it is a significant part of the mission’s history. I also think the regional barons who bankrolled the mission’s construction should present another potential conflict, but that idea seems to have been dropped after its initial mention. The map looks good to me. This is pretty much what I expect from a fortified mission. The legend clearly defines all the rooms in the location, and the objects are clear enough so you don’t need to indicate those on the legend. I have to admit the broken furniture, the blood smears, and stains were nice touches that drive home the notion something terrible happened here. A cartographer should have plenty to work with to create a map from the one given here. You indicate the mission having improvised traps, so it would have been great to see trapped locations on the map. You don’t have to detail them, but it would help GMs run with their own ideas. Your text is clean, and I found no glaring grammatical or spelling errors. There are a couple of times where you state the villain’s prowess rather than show it. For example, you could have eliminated the opening clause in “Exceedingly clever even for his kind, the incubus sowed the seeds of war.” The following text shows him being clever and outmaneuvering everyone. I also got tripped up over the incubus having “tenuous” control over the fortress, and the following sentence reinforcing that point, even though it starts with the word “yet.” If he has tenuous control, then it would seem he would want to consolidate his control before growing arrogant and making future conquest plans. Finally, the notion of the incubus sitting upon the defiled chapel as through it were a throne confused me. I imagine this should have been an altar in the chapel. Overall, there is plenty GMs can work with to make this a captivating adventure location for many party compositions. There are some gaps here and there in the writeup that would have added dimensions to the conflict you present in the location. This and a couple of other minor missteps cause me to give this a weak recommendation for advancement. 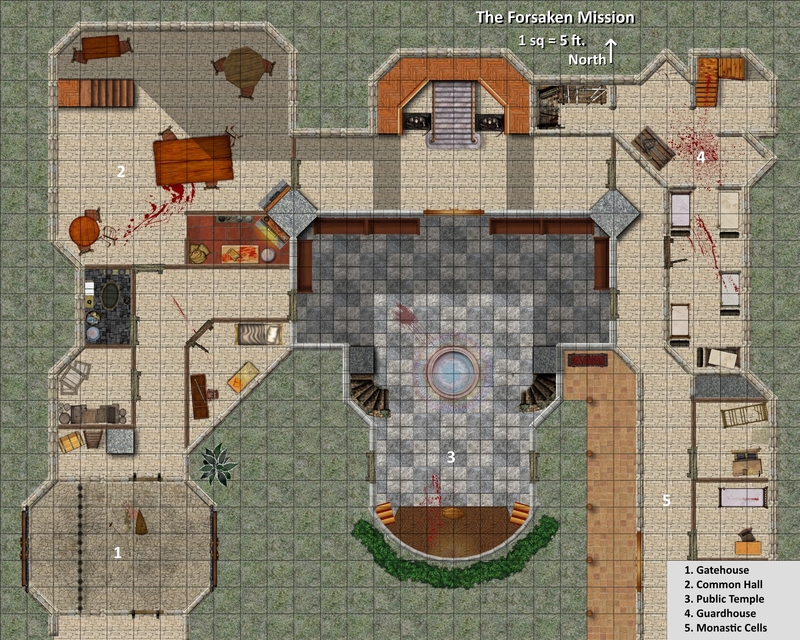 The Forsaken Mission offers a whole lot going on for GMs to play with, including themes that strike real-world parallels should they choose to go in that direction. The writing is for the most part evocative and really draws me into the overall location. There are many ways this adventure site could be used, and while it's likely going to have a lot of straight combat, there's also potential for more nuanced interactions, perhaps trying to get allies against the incubus. There are plenty of potential plot hooks and ways to involve the PCs, including these regional barons. Speaking of which, their backing of the mission hardly feels like a terrible secret to me; I think the secret was that the seeming well-intentioned mission was actually a tool of the barons to exert control over the surrounding wilderness and its inhabitants, which is intimated but kind of skirted around. Also, a quick comment about names: I think Rakaz'greh is a solid name that sounds fantastic but isn't too difficult to pronounce (though I know some people loathe apostrophes in names to the point the editing panel at PaizoCon joked about allowing one per career). However, I think calling this the Forsaken Mission seems like a bit of a copout. While that's maybe a descriptor of it, at some point it would have had a real name, and I think that -- or perhaps some corrupted version of it (i.e. going from the Sunlight Mission to now being called the Sunfall Mission) -- would work better. If someone hires PCs to go clean this place of evil, I think they'd be more likely to refer to it by that previous name. The map itself looks good, in general. There are multiple entrances to the mission and multiple ways to move around inside, meaning there are choices for the players to make. Rooms are interesting shapes, and look big enough for a fight to take place, especially the public temple (I'm assuming that's the chapel where Rakaz'greh has set himself, though they do use different names, so can't say that with 100 percent certainty) That said, I'm a little confused what's going on at the bottom of the map: Room 1 is labeled the Gatehouse, making me think it's the entrance, but it still just seems to cut off. It looks like there's a second floor -- I think that's the shaded areas based on the stairs, but it looks like there's a stairway also in the very northeast area. Considering all the things going on here, I expect this location to be bigger, but I'd also expect the whole first floor of the map to fit on one page. I think there's some tightening in both prose and cartography that need to take place, but the overall strength of the location as a possible adventuring site outweighs those concerns. I do recommend this for advancement. Congratulations, Matt. Putting yourself out there to compete in anything is hard, and designing RPGs is hard. Particularly designing adventure settings or locations. You have to be able to suggest some ideas about personalities, plots, terrain, and more, and have GMs chomping at the bit to add your location to their regular game. Let's see how you did! I believe in positive feedback and honest criticism that should make you better at every part of this gig. So to start positively, I want to say you've given us a complete entry with a passable map, background, multiple opportunities for encounters, and raised stakes. Though there are some fun entries in this round, this one sets a great example of a complete adventure location. You've even added role-play opportunities with bitter fey who may or may not ally against our incubus villain. I think this is a great entry and I wish you luck in this contest. Well done on making it through Round 2. That's quite an accomplishment. First, regarding how a professional cartographer might look at your example map. I think there would need to be some clarifications. I see stairs and ladders, and I would assume there would be multiple levels, since this is a fortification, but I have a hard time figuring out the shading and shadows you have. Like motteditor, I can't tell what the shading means in room 2 or the area east of it and north of room 3. It looks like there are stairs going up to a wooden observation point, but room 2 makes it seem like it's only half covered. The same with the temple in room 3. It seems like it's open to the sky without any obvious form of lighting otherwise filling the room. I can't tell if that means there's a balcony or gallery looking into rooms 2 and 3, which could be a good spot for archers to fire down into. Also, I don't know what those bars in room 1 signify. It's the gatehouse, so presumably it will be a defensive area, but I can't tell if it's a barred wall that's supposed to have a door in it, like a jail cell, or if it's meant to be a 25-foot wide portcullis that can be raised and lowered. I see no objects indicating a crank or machinery, but those would likely be in a room above it, but again, I see no certain indication of such a room, other than a ladder in the corridor north of the room. Some of your backstory space should have been used to give your map rooms more clarity. Other than that, and this might just be me personally, but the overall gray tones tend to blend the whole map together at first, I might have used a bit more green or brown for the exterior area and interior garden courtyard just to really bring the floor plan into focus or more distinctly indicate outdoor/open areas. Second, from the stand point of an exciting encounter location I don't see anything that would make me thrilled to run a battle through it. By that, I mean if I were to look at this from an assault or defense standpoint, how might this map generate tactics or ideas for fights that I wouldn't get from just any room in any dungeon behind any door the PCs might enter. We have room 1, the gatehouse. That looks good for a battle, the enemies have a gate/portcullis(? ), the PCs bust down the door on the west side, have to deal with some enemies shooting at them and then raise the gate/open the door to advance. But from there, they just get past the east doors and they're in the courtyard, which is an easy stroll right into room 3, the public temple. Like the others I don't know if that's the 'chapel' you refer to your boss NPC sitting upon (is he perched on the roof, or did you mean he sits on the altar in the south end of that room?) and if they enter there, they're basically 25 feet away from where he would be expected (assuming he didn't change his position). All that takes away having to pass through the nameless corridors and rooms to area 2 or having to go upstairs and then move around to reach area 3 where you would at least have some distance to make an encounter that lasts more than 2–3 rounds in the chapel. At its base, this map shows the ground floor of a temple. You have the gate, you have a series of rooms that might realistically exist (common rooms, armory in the guardhouse, a defensive-looking gatehouse, some sleeping chambers, etc.) I even see what might be a laundry/bathroom. Presumably any other rooms I might reasonably expect to see in a fortress/mission may be 'off screen' or maybe in fortified cellars or lower levels elsewhere. The map looks incomplete. While there are limits to map size for this round, to me it looks like it leaves to much unseen. I can't tell how much more of the location there should be or what might be found there and it's not like it's unlikely to become an issue. The way the map is laid out the party will presumably enter or attempt entry at Room 1 (yes, they could try and scale the the walls anywhere or bust through the stone, but we still need to plan for the most common occurrence or scenario). At that point in Room 1, they can go north (through your room layouts), east (leading right into the temple/chapel and presumably the end boss), or south... and into the unknown. That's a 1/3rd chance of nullifying the encounter area map right there in the first room. Also, other than the barred wall in the gatehouse (again, not sure if it's a portcullis or just a row of iron bars to allow shooting or stabbing through), there's no other real defenses that indicate this is a fortified or defensive structure (I get that it's intended to be a monastery, but you even call it a fortress yourself). I see no arrow slits or windows or indication that there's any way to defend the front gate other than once intruders smash down the doors and are in Room 1. I see a guardhouse, but it's way on the opposite side from the gatehouse where they might be needed (as opposed to being a barracks where the guards slept). Does the room 4 guardhouse double as a defensive tower or turret on the northeast side? I can't clearly tell. There's almost no indication in the writeup to help me fill in any gaps. Additionally, you mention haunted catacombs and fortified cellar, yet I see no indication of any such entrances or areas that might allow access to such things. Are they off the map or are you just referring to potential locations elsewhere in the forest at large where people are hiding in cellars and there might be undead?